scripts and see if I can integrate everything. Don't surrender if there is no immediately response... some of our main developers are busy with real life at the moment. Hi HendrikL, I would like to see something between those two models: left is too dark for me, and right is too light. Is it possible to change that easily? Maybe light/shadow colours are the solution? 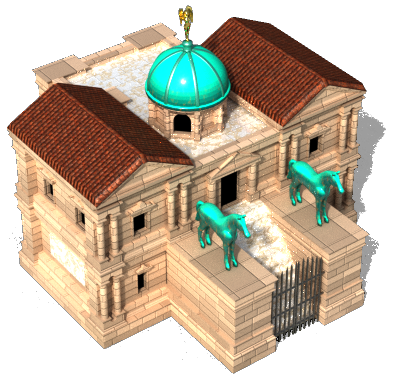 Also, the 2 screenshots don' have the same angle for the building - did you base your own Python scripts on innerBuilding.py? I have no idea what's causing the crash, I would need more details, e.g. a copy of the Lua file and the crash log. Maybe it's a bug. 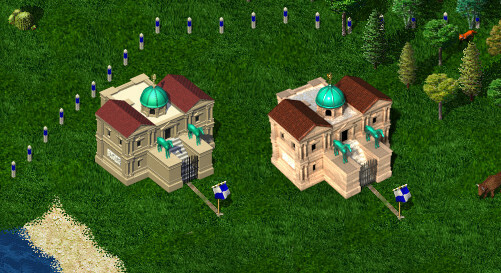 It seems the new render uses a perspective camera while the other one uses an orthographic one - the orthographic one is correct for Widelands. I think the flat looking shading of the original fits better into the Widelands world - the other somehow looks too realistic. Also the (very cool!) details like the shingles and the individual stones of the walls become rather muddy at the default Widelands resolution. zation of the whole light environment. So please always keep in mind that I show work-in-progress. Blenders old render engine does not have a lot of flexibility. the map, because it encounters an unknown token "scale". Could you be using Widelands build 19? If I'm not mistaking, the scale attribute was only added after the last release, so you'd need a development build. It is demonstrated in the Barbarian warehouse, you can check if data/tribes/buildings/warehouses/barbarians/warehouse/init.lua contains a "scale" line. The high-resolution warehouse also demonstrates the challenges of making better graphics look good on lower resolutions (eg. the grass on the roof)... Also, you should set "scale=4" instead of 0.25, otherwise you'll get a rather huge HQ. Widelands' style is more cartoony, not just the existing graphics, but also the fighting, the simplicity of the game world, the fact that a single carrier can lift a marble column, et cetera. Your HQ makes me think of 0 AD, it looks very nice but a lot more serious. But I do think you have the talent to make Widelands look a lot better than it does now! mind widelands looking a bit more like Settlers 3? loaded, I'll retry with the latest build. Yes, you can animate any terrain tile you like. Changing terrain tile size would need some recoding in the engine I guess - I don't know how it will react to bigger tiles. It is certainly something to think about though now that we have a zoom feature. Small update: I downloaded and tested the newest build. rendering with the hint you provided. eightfold, if I did my maths right. gardens, waterfalls and the occasional crystal. tiling seems to work correctly with a texture I tested. that topic once I have some replacements ready.